The success of a professional team in the modern era of Rugby football can often be measured by their capacity to offload in contact, accurately and under control. In his coaching module on Offload and Continuity, Gregor Townsend insists on the importance of creating the conditions for an effective offload with the ball-carrier entering contact on his own terms – either by establishing positive momentum with a powerful forward step, or by pushing the tackler away from his body with a fend, or by working his arms and shoulders either past or above the level of the tackle. One of the specific situations from which an attacking side can look to build momentum from an offload is in the receipt of high kicks. 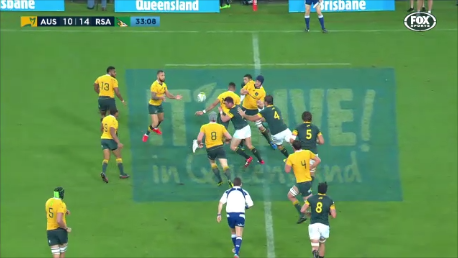 There were a couple of excellent examples of just how effective this method can be in the recent Rugby Championship match between Australia and South Africa in Brisbane. 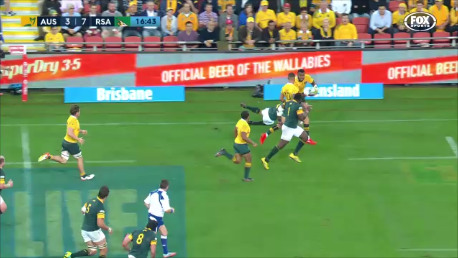 The receiver of the high ball in both cases is the Wallaby full-back, Israel Folau. The first event took place midway through the first half. •	As soon as Folau catches the ball, he is looking to take a first step straight forward at 16:37, as Gregor Townsend recommends. This puts him on the front foot physically. •	Four defenders have now converged around the ball, so as in the coaching module drills this is the right time to make the second pass and exploit the lack of defensive width. 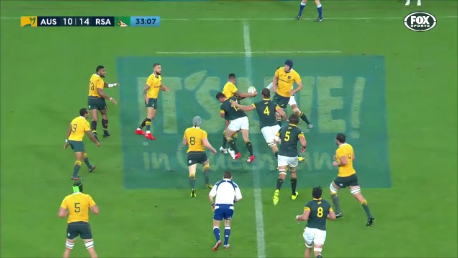 Cooper immediately looks to his outside, running at the last defender Bryan Habana before springing his centre Samu Kerevi down the left side-line for the clean break. The second example occurred in the last ten minutes of the first period. At the moment of delivery Cooper is no more than one metre from the ball. 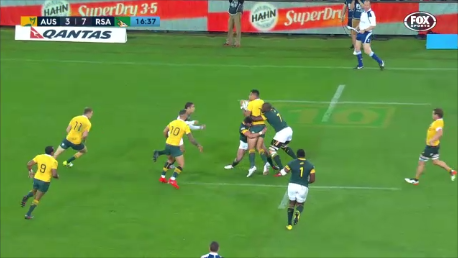 •	As the offload is delivered, there are four Springbok defenders converging on Folau. Although space and time are both short, Cooper immediately makes the ‘no-look’ pass behind his back to ensure continuity after the offload. 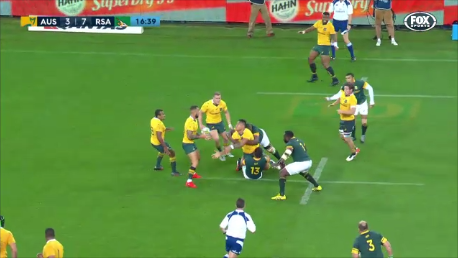 Kerevi finds himself in space down the left once more – all because the second pass has been made after the defence has been attracted to the initial contact point. Very few of us have the height, physical strength and ball-skills to be able to offload in contact like Israel Folau! However, by following the simple rules set out by Gregor Townsend in his coaching module, one offload can fan the flames of a significant attack – especially from kick receipts. Establishing the first step ‘punch’ of forward impetus, getting the arms and shoulders above or past the tackler(s) for the passer; keeping support play short, patient and behind the ball, and making the second pass to exploit width after the offload for the receiver are all essential ingredients in the recipe Gregor Townsend provides.